There is a number of external peripherals that are supported on Poynt by default. However there is a wide number of other peripherals (or accessories) or models that merchants may want to connect to their terminal and to ensure that developers can connect new devices we have provided an API to do that. 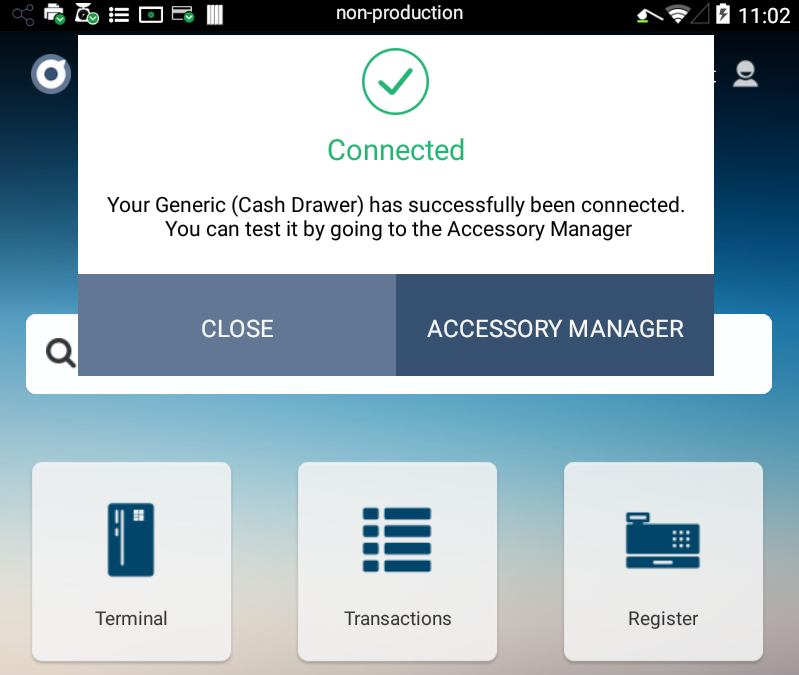 An Accessory Provider is a android app that manages one of the accessories connected to Poynt device. Example of accessories are Cash Drawer, Cash Register, Scale etc. 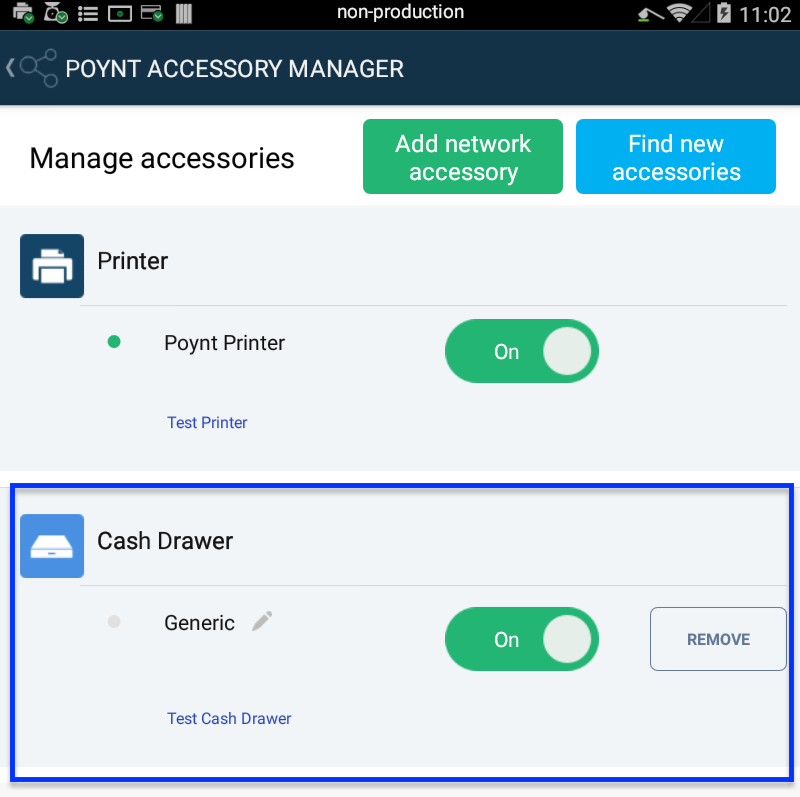 Once implemented, merchants can connect to the new accessory using Poynt Accessory Manager. Register your app with accessory manager by providing an xml definition in your AndroidManifest file. Create a Accessory Broadcast Receiver class to handle ACCESSORY_ATTACHED and ACCESSORY_DETACHED intent action. Create a Accessory Service class that will initialize and talk to the actual accessory when the events mentioned above are received. Expose Accessory functionality to rest of the system by implementing standard service interface. Registering accessory provider with Accessory Manager. First step of providing a support and managing an accessory is to register your app with Accessory Manager. You will also need to register your BroadcastReceiver class and the Intents ACCESSORY_DETACHED and ACCESSORY_ATTACHED as you see above. Define the information of the accessory in an xml file. You will need to know the vendor id and product id of your accessory device. <!-- model-name: Name of accessory as understood by user. Implement Broadcast receiver for receiving Accessory events.
} // other device type if supported. }// other device type if supported. Implement Accessory Service that will initialize the accessory and will implement a accessory service interface to expose the functionality of its accessory to rest of the system. * Implements interface to provide draw open command to the client via service api. Once you install your accessory app and connect the peripheral you should get a notification from Poynt Accessory Manager. This notification will only show once. If you go to Settings > Accessory menu you will should see your accessory there and you can always remove or disable it if needed. To create an accessory app for a printer you need to implement IPoyntPrinterService, and IPoyntScannerService for a scanner.